Sec. 14-204. – Monthly charges. Water meters.Each user shall pay for the services provided by the city based on their use of the treatment works as determined by water meters acceptable to the city. 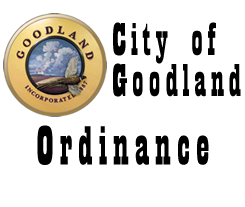 Residential Charges.All residential contributors within the City of Goodland shall be charged a base charge in the amount of $14.00 per month. Nonresidential Charges.For nonresidential contributors, monthly user charges will be based on water used during the current month as determined by the contributor’s water meter. Provided: if a nonresidential contributor has a consumptive use of water, or in some other manner uses water which is not returned to the wastewater collection system, the user charge for that contributor may be based on a wastewater meter(s) or separate water meter(s) installed and maintained at the contributor’s expense, and in a manner acceptable to the city. Incremental Increases. Beginning January 1, 2020 and continuing each year thereafter, the base charge for residential and nonresidential contributors shall increase by $0.20 annually. Incremental increases may be waived for the following year if such action is recommended by the City Manager and receives approval by the City Commission. Any action to waive said incremental increases shall only apply to the following year. For those contributors that contribute wastewater, the strength of which is greater than normal domestic wastewater, a surcharge in addition to the normal user charge will be collected. The surcharge for operation and maintenance including replacement is $0.91 per pound of BOD and $0.91 per pound of SS, and the additional surcharge for debt retirement is $0.00 per pound of BOD and $0.00 per pound of SS. Toxic discharge.Any user who discharges any toxic pollutants which cause an increase in the cost of managing the effluent or the sludge from the city’s treatment works, or any user who discharges any substance which singly or by interaction with other substances causes identifiable increases in the cost of operation, maintenance, or replacement of the treatment works, shall pay for such increased costs. The charge to each such user shall be as determined by the responsible plant operating personnel and approved by the City Commission. To whom charges apply.The user charge rates established in this article apply to all users of the city’s treatment works, regardless of their location. SECTION 2. This Ordinance shall take effect and be in force from and after July 31, 2018.